Named after Australia's Len Colgan. Julie Batty 12/17 T. colganii ? Julie Batty ... "the attached pics are of my colganii flowering about this time last year. Well, it has ‘colganii’ on the label but after seeing Len’s the form of my plant didn’t seem a good match. Meanwhile the label will stay on as a ‘maybe’." Plant saxicolous, pulvinate, often branched, with stout, branched, light brown roots, flowering 10-15 cm high. Stem longer than the rosette, short to 13 cm long caulescent, to 7 cm in diameter, sometimes slightly secund. Leaves 12-14 in number, polystichous, 3-7 cm long, the lower ones reduced and with short acuminate blades, the sheaths erect or suberect, the blades spreading or recurved, coriaceous-subsucculent, with asymmetric keel, green-grey, covered with appressed cinereous scales, looking grey, abaxially strongly nerved and looking striped, the margins with asymmetric trichomes. Sheaths 2-3 cm long, 1-1.8 cm wide, ovate, merging imperceptibly into the blades. Blades 1-1.5 cm wide at base, triangular, attenuate, subulate, channeled. 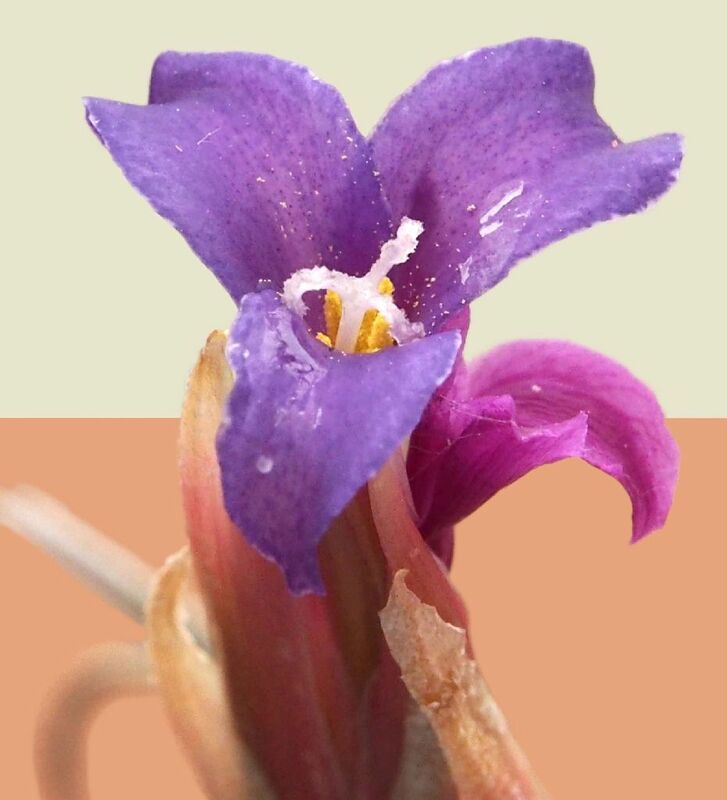 Scape erect, short and stout, from practically none to 1-2 cm long, nearly hidden in the rosette, imbricately concealed by few scape bracts, the lower ones foliaceous, lepidote and attenuate, the apical ones like the floral bracts, acute, red, becoming more and more glabrous. Inflorescence terminal, simple, exceeding the rosette, 3-4 cm long, 5-8 (-10) mm wide, lanceolate acute, subterete, composed of few (2-3) distichous, sessile odorless flowers plus 1 sterile bract at the base, rhachis nearly straight, 4-angled, green, glabrous. Floral bracts imbricate, the rhachis at anthesis not exposed, 1.6-2.5 (-2.8) cm long, exceeding the sepals, 8-10 mm wide, ovate-triangular, acute or cuspidate, submembranaceous, ecarinate, adaxially nerved, abaxially sublustrous wine-red, glabrous, the apical 4-6 mm finely grey lepidote. Sepals 1.4-1.6 cm long, 4.5-6 mm wide, narrowly elliptic, acute, free, membranaceous, the posterior ones carinate, thickened along the keels, greenish with pink tips. Petals 3.6-4 cm long, the blade 5 mm wide, obtuse, the margins entire not serrate, claw 3 mm wide at base, forming an erect tube with open throat, their tips spreading to strongly revolute, aster-violet, white at base. Stamens barely included and visible, as long as the pistil, stigma 2-12 mm exserted from the throat of the corolla. Filaments 2.5-3 cm long, 0.8 mm wide, flat, thin towards the base, straight or once transversely plicate, anthers 4-5 mm long, 0.5 mm wide, linear, acute, basifixed, yellow. Pollen lime-yellow. Style 2.5-3 cm long, 1 mm wide at base and white, 0.7 mm wide at apex and yellowish, surpassing the stamens, stigma 4 mm long, 3 mm wide, lobes spreading, narrow, papillose, yellowish. Ovary 4 mm long, 2.5 mm wide at base, ovate, light green. Distribution: Bolivia. Dept. of Santa Cruz, Prov. Mendez: Paichu-Canon, 2700-3200 m. The plant is currently known only from the type location. It was collected for the first time in July, 1993 by Len Colgan from Australia, Ewald Heger, Wolfgang Krahn, and Helmut Alber from Germany. It was re-collected in March, 1995 by Frank Hase, Ewald Heger, Lotte Hromadnik and Renate Ehlers. The plants grow in large clumps on the rock walls of the Paichu Canyon accompanied by Tillandsia aff. lorentziana, T. sphaerocephala, Blossfeldia sp?, and Puya sp? 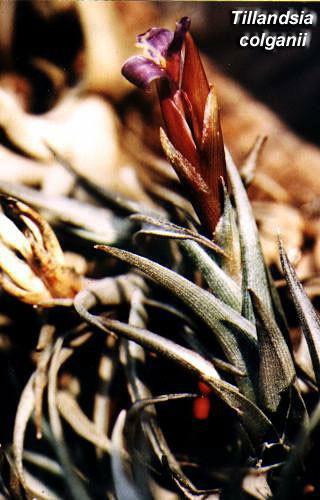 Tillandsia colganii is dedicated to its discoverer Len Colgan, from Adelaide, South Australia, who discovered the plant during a trip to Bolivia in July, 1993. Mr. Colgan is the President of the South Australian Bromeliad Society and an avid bromeliad grower who, through many years of contact and cooperation, has become a good friend. In July and August 1993, I was honored to be invited to join three imminent German cactus enthusiasts on a five-week camping and discovery trip covering an extensive area in Bolivia. I clearly understood that this was primarily a cactus¬oriented expedition to study species in habitat. Nevertheless, the other members were extremely considerate and I was able to gather tillandsias from fifty locations during the trip. 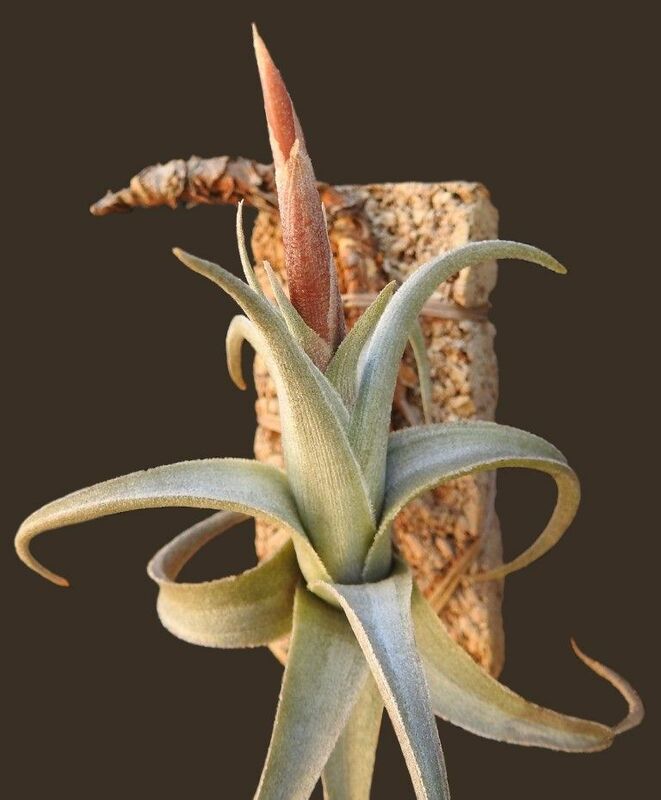 It is relevant to know that Ewald Heger, Helmut Alber, and Wolfgang Krahn not only have a number of cactus species named after them, they have also discovered individually some Tillandsia species, including T. hegeri, T. alberi, and T. krahnii. We travelled through the Andes at altitudes varying from a snow-covered 4700 m ranging down to a temperate 1500 m. However, most of the time was spent in the mid range around 3,000 m. The main hindrances were the bad roads and tracks, and the suffocating dust. 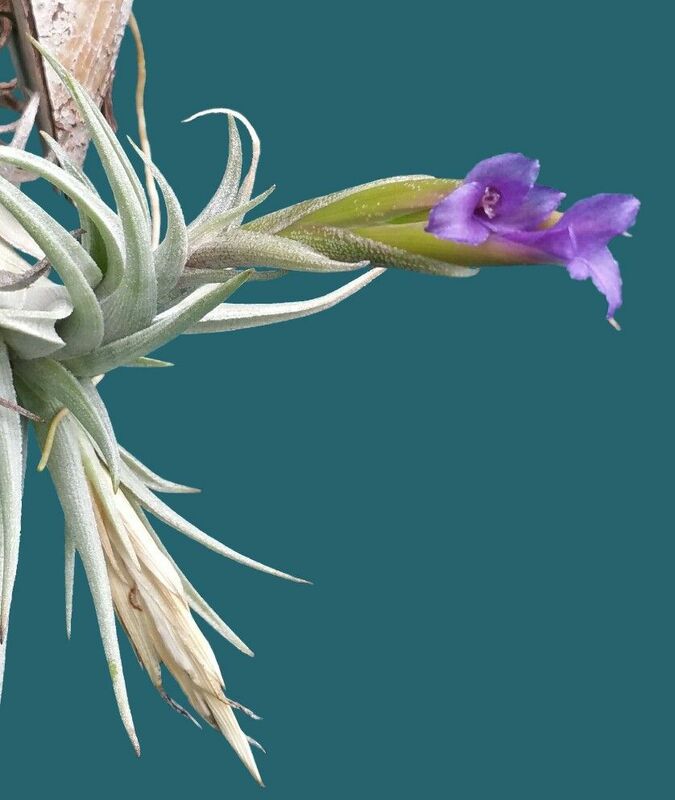 It soon became obvious that cactus devotees have searched Bolivia thoroughly, but there are still many new opportunities for Tillandsia enthusiasts. Just after the trip's midpoint, we arrived back in Iscayachi, in southern Bolivia. Our detailed map showed a trail heading due north, but we could not find an access, as we were blocked by either deep trenches or a wide river. After multiple versions of advice from numerous sources, we eventually found a ford to cross. Surprisingly, the road was not nearly as bad as it had been for most of the rest of our trip in Bolivia. The first excitement came when the German collectors thought they might have found a new cactus variety, as well as some rare Blossfeldia species. Photographs were taken and details recorded. 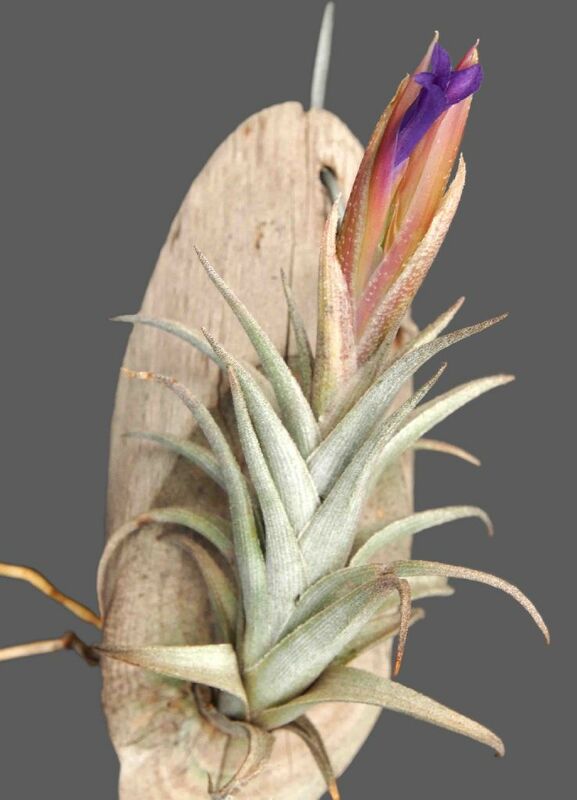 This increased the likelihood that new Tillandsia discoveries might lie ahead even though the only bromeliads seen were Puya and Deuterocohnia species. Eventually we inched down a steep section, getting covered in layers of dust in the process, after which we were able to find and collect clumps of a fascinating Tillandsia growing on rocks. The plants were covered with a dense white layer of trichomes, giving it a distinct appearance. They keyed out to be somewhere between T. lorentziana and T. zecheri, having a single spike with red bracts and blue flowers. Further on we found another group of tillandsias. At first glance I knew this was something new. The only other species that seemed similar was T. hegeri, which we had collected some weeks earlier, but with which there were significant differences. To proceed further we had to drive in a river bed up the Peichu Canyon, where we discovered more plants of the same two species. This location was more moist than the previous ones. Beyond that, I recall one photograph of six different attractive Cactus species growing together. We experienced several more tire punctures, due mainly to the dangerous branches of thorn bushes hidden under layers of dust. When we eventually returned to Iscayachi, there was no doubt that this two day detour had been rewarding for all of us. 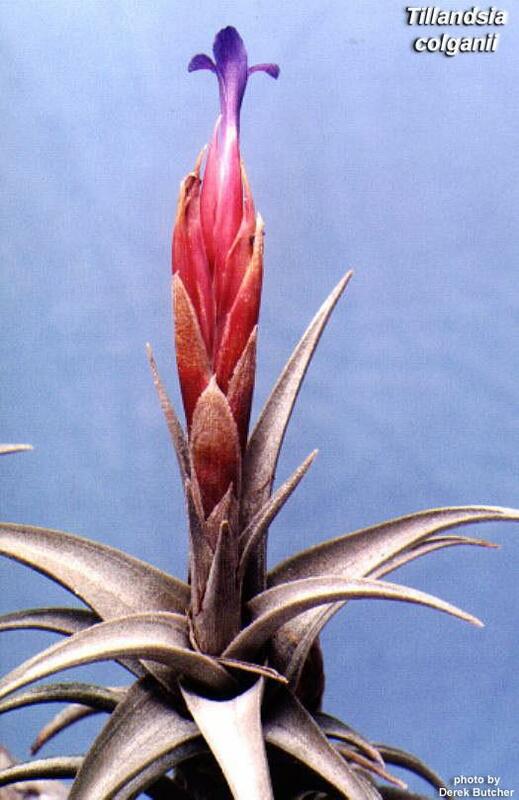 The second of these two tillandsias found that day is now named T. colganii, and I thank Renate Ehlers for that honor. She went to the same location in early 1995, in a group also led by Ewald Heger, and collected the same species that she has since described and generously named after me.